Alphabet Inc. is a holding company that owns Google, YouTube, Nest, and several other powerhouse companies. 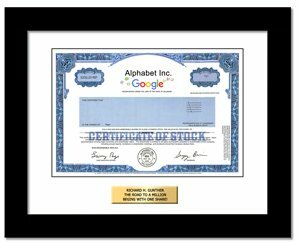 As of May 2014, Alphabet (Google) stopped issuing paper stock certificates and registers ownership electronically instead. The recipient still becomes a real shareholder of Alphabet Inc. with all associated rights. * Because Alphabet's high stock price and the fact that the SEC requires us to charge a minimum of twice the stock price, you may be able to purchase it more economically through a broker. We keep it on our website because our services are faster and easier than a broker and we offer the framed, personalized replica certificate with founders, Larry Page and Sergey Brin's, printed signatures.